Long before there were awesome things to watch on modern TV, like pro wrestling, epic summer movies, and binge-able television shows, people had to get creative to stay entertained. Otherwise, they might have died of boredom, which considering how much easier it was to kick the bucket in ancient times, was probably a legit possibility. However, a citizen in Ancient Rome could always take a trip to the local arena to see a gladiator fight, which would liven up a dull afternoon in no time! Though back in those days, if your attention couldn't even be held by watching two dudes in flashy armor get into a bloody brawl, you could test your prowess by stepping into the arena, yourself. It wouldn't be our first choice for entertainment (since gladiators had notoriously short careers...), but if you have an unquenchable thirst for action, a life in the arena might be your ticket to glory! In the modern age, battling to the death for sport is usually frowned upon. 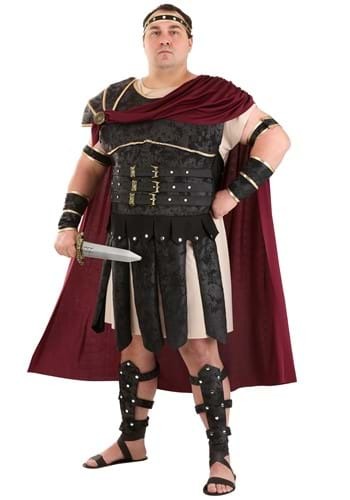 But when you're wearing this Plus Size Roman Gladiator Costume, you'll have the look of a fearless ancient warrior, so you can fight for honor in a new type of arena. Yes, we're talking about costume contests, which aren't nearly as gruesome as classic gladiator fights, but can be just as ruthless, and the stakes just as high! This striking costume features nearly everything you'll need to get the edge over your opponents, including foam and faux suede leather-like armor pieces. With this fierce, ancient style aiding your quest for glory, you'll be the undisputed champion of the costume contest colosseum!